The overall focus of Dr. Warren’s laboratory is cancer immunology. His particular interest is the mechanisms and molecules that mediate graft-versus-host disease (GVHD) and graft-versus-tumor (GVT) activity after allogeneic HCT, as well as the mechanisms that mediate tumor regression after treatment with other modes of immunotherapy such as immune-checkpoint inhibition. 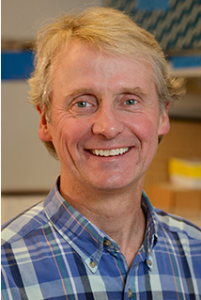 His lab has extensive experience with characterization and manipulation of human T and B lymphocytes, identification of antigens recognized by T and B lymphocytes, comprehensive analysis of T- and B-lymphocyte repertoires with the aid of high-throughput DNA sequencing, and assessment of adoptive cellular therapy in murine models. Dr. Warren’s laboratory also has a strong research focus on lymphomas that affect children and adults in sub-Saharan Africa, particularly Burkitt lymphoma (BL).